I’ve mentioned our Matchbox garden periodically. It’s a tiny garden that enables us to retreat to peace when we have to go to the city to stay. The kind of place, outside our back door, that is surrounded by bastion-like brush fences and a feral hedge that we’ve tamed on our side. 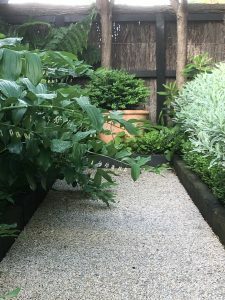 We took over this garden when it was tired, unstructured and forgotten, and whilst the design is a little square and unimaginative, we knew we needed grass for the dog and mostly raised beds for our oncoming old age. The garden is beset with baking sunshine in summer and dark shade in winter, so planting has been challenge. Not only that, the soil is heavy clay which has made the raised beds a godsend. So as part of SOS, here are my six. 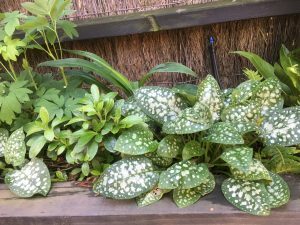 On the advice of Jim and others from the SOS blog-hop, I moved Pulmonaria Sissinghurst White to the shade and it has tripled in bulk and is looking so grateful. Its leaves are putting on such a beautiful show, so thank you SOS folk! 2. 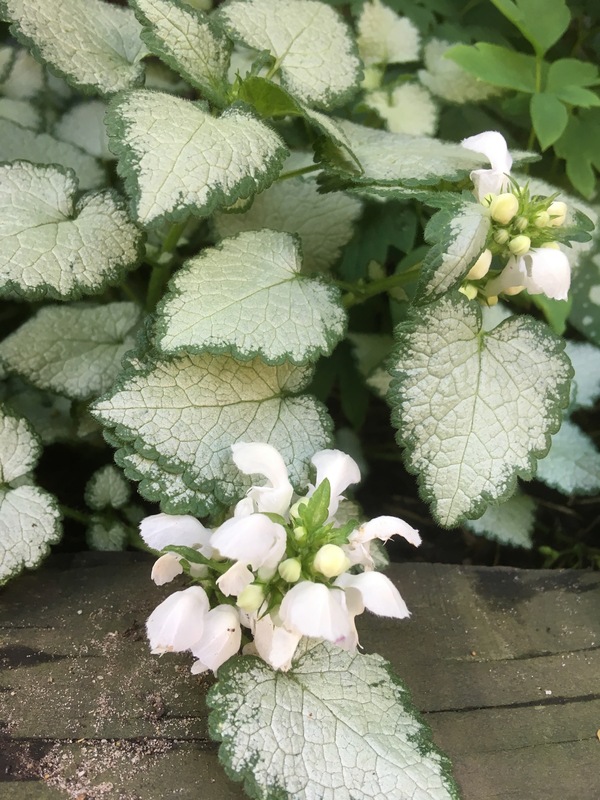 The Lamium (Maculatum White Nancy?) is so pretty, and what a partner for the Pulmonaria! Its leaves alone are stunning and then the delightful little flowers popped out and I’m so glad I finally purchased it for my shady spots. I can see the need to buy more for underneath the Solomons’ Seal. 3. 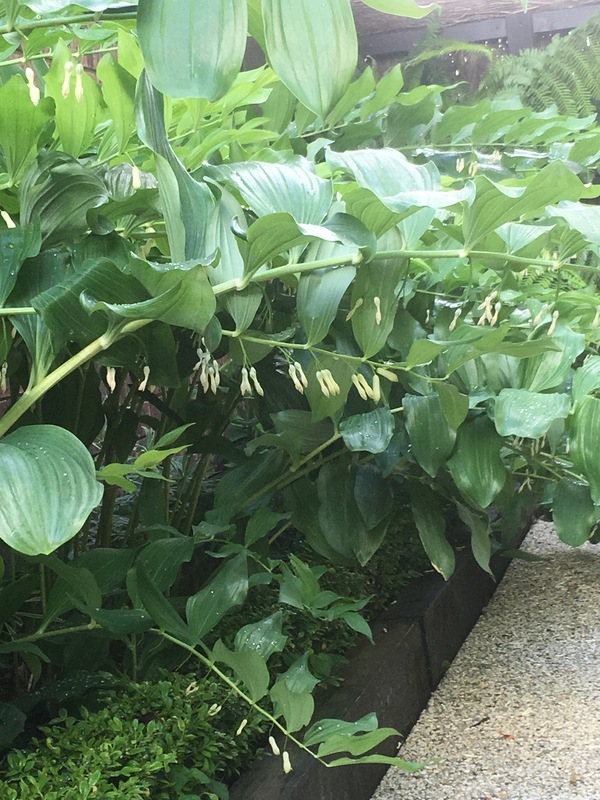 The Solomon’s Seal has gone ballistic. And I’m happy. This back path is so dull, goes nowhere and needs plants that shout out. Solomon’s Seal does that. Just imagine it with the Lamium! 4. 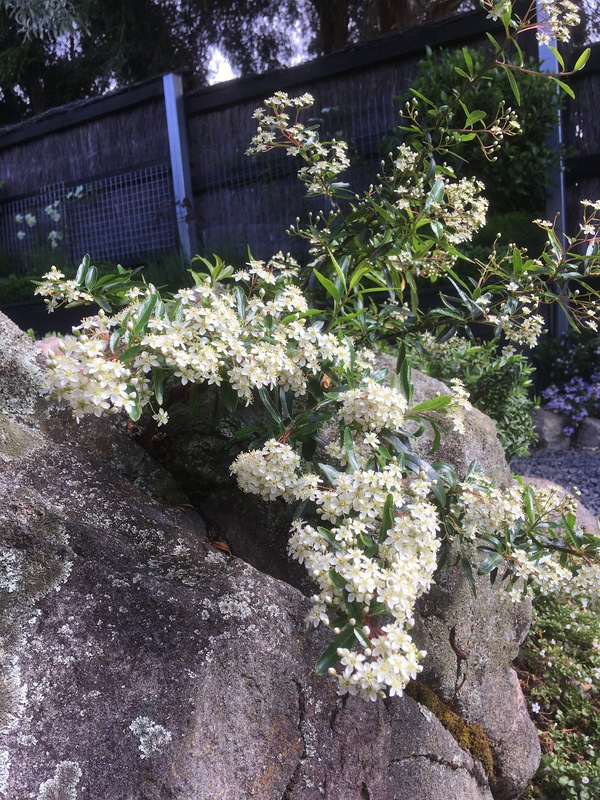 This is an unknown Tasmanian native self-seeded from the bush behind the school which is behind us. It’s growing out of the most microscopically narrow fissure in a huge rock and has grown significantly this year. It can reach heights of maybe twenty feet and so I’m going to attempt to prune it ‘artfully’ so that it looks like a bonsai. I might even use a bit of bonsai wire. Who knows? 5. 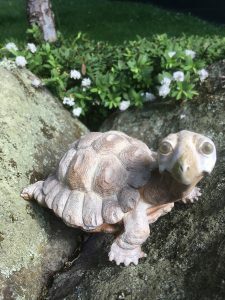 Ah, Thomas the turtle. We found him in the garden when we bought the house. 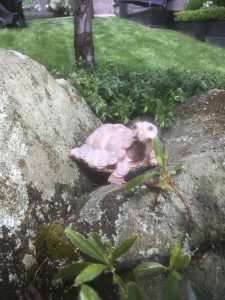 So, believing it was his home by virtue of adverse possession, we find he sits in the garden quite happily. I do encourage him to move periodically so that his view changes, but he moves very slowly. He’s been on the rock for over 6 months. Seems to like looking down toward the fern garden. 6. 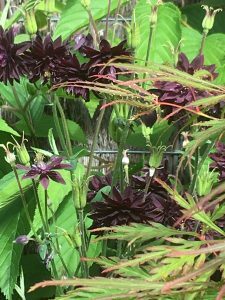 I’ve got to include this because I think the Aquilegia (Black Barlow, I think) just looks wonderful growing through the miniature standard Acer and the Viburnum Plicatum. It’s like reading Garden Illustrated and such a nice way to spend a couple of hours in the weekend. The garden looking fabulous Prue, I am going to try and get into mine this morning for a wee while. I need the solitude. It’s so tiny, Libby. Very easy to care for and despite it’s straight lines, I do love it so. It’s tranquil – especially with such muted plantings. Do enjoy your solitude. You need some time out! I have put your email aside and will spend time this week answering – bear with me. Babysitting for a whole day has rather set me a day or so behind with everything else. No rush Prue, I spent a lovely time there did see and chat to my neighbours too ..so most enjoyable indeed. Love that acer’ aquilegia combo. Really nice. 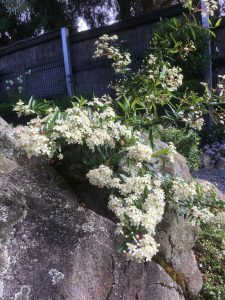 So much wonderful foliage in your garden that gives it a light, restful feel. Lovely. That’s what I have been hoping for, Lora. Thank you. That lamium is a real beauty, it would quite enough just on merit of the leaves, but the flowers are special too. As for Nora, she is a stunner, quite a contrast! Stately and yet with its own mind. I am really enjoying your SOS – your garden is just so charming. Thank you for sharing with us. Thanks so much, Judy. I’m loving SOS. i’ve learned so much from all the contributors. 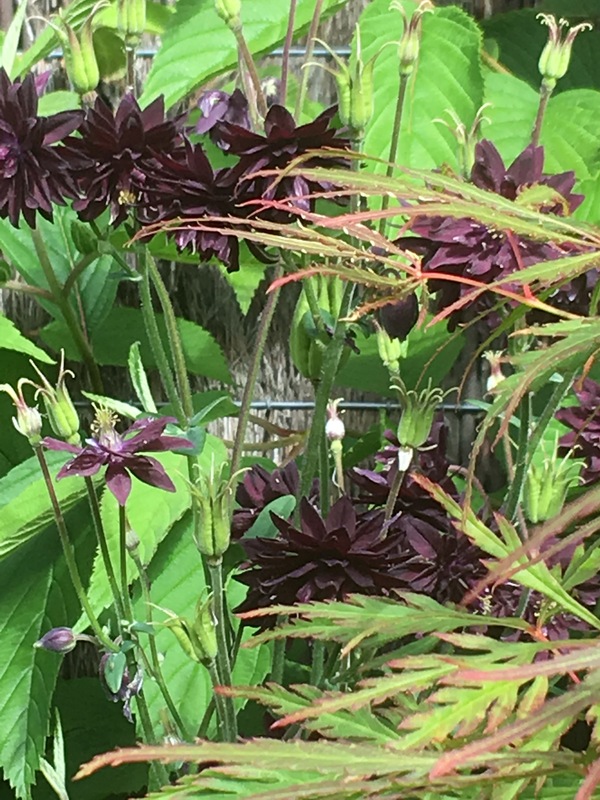 You Aquilegia ‘Black Barlow’ looks very happy in its position. I planted one also, and it has very quickly become downcast, nothing like the one I featured in my six this week. Lovely shades of green and white in your garden, it seems very cool, a place to enjoy. Hi Jane. I think I purchased them all from Garden Express, not completely sure. But yes, they and the white ones have done really well in the tiny town garden. 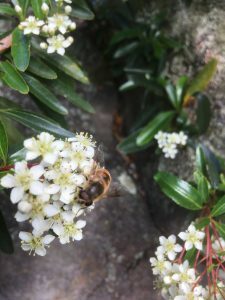 I’d like to try and transfer seedlings to our coast garden. I’ve got standard aquilegias that have been here since the year dot and self-sow brilliantly so I’m guessing the new varieties may also survive. I do love green and white (and black tones) in a garden. For me its calming, cool in summer and reflects light at night as well as in the day. Not to everyone’s tastes though. Ooh I like the lamium. That’s a new one to me. I have a perfect shady spot for it. Adding to the list…. It’s lovely isn’t it? So flirty and pert with its silver skirts and pretty face. What a beautiful place, Prue and stunning plants. The Pulmonaria is a revelation to me. I’ve only got self seeded purple ones in my garden. Thanks Katharine. The garden is teeny-tiny but it’s my little city refuge.